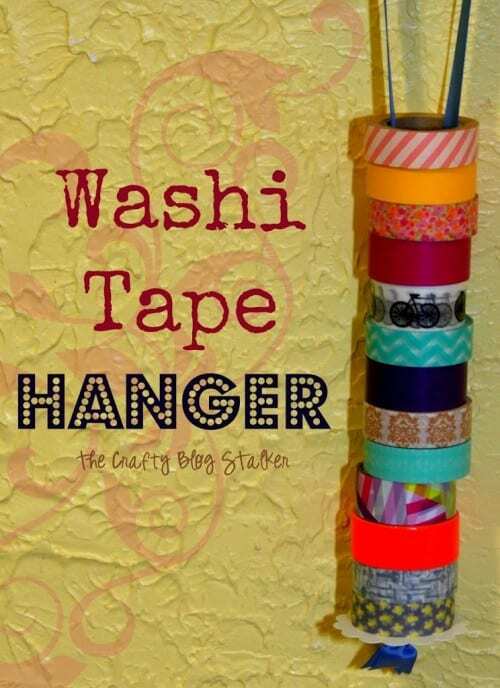 Organize and store your washi tape with a Washi Tape Hanger. This organizer is an easy DIY craft tutorial idea using items you probably already have! Are you obsessed with washi tape too? I can’t get enough and love to washi tape EVEYTHING! While at work I washi’d my iPad keyboard, lotion containers, claw clips and my stapler. Then I came home and washi’d the letter A for my daughter Allie. Now that I have all of this wonderful washi tape and the question came up of how do I store it? I did a search on Pinterest and found lots of fun ideas but they all included finding that perfect container that they would fit in, and honestly, I didn’t want to go to every store looking for that perfect container. I wanted to make one too and it was really quite simple. Use a heavier card stock and punch a circle with a 2 3/8-inch scallop paper punch. If you don’t have a paper punch you could easily cut a circle by hand. You just want it to be a little bit bigger than the washi tape since this will be the base. Use a hole punch and add a hole to the center of the shape and make the hole just a tiny bigger by pushing something through the hole like a pen or an embossing tool. The hole needs to be a bit bigger for the ribbon that I chose. Cut a 16-inch piece of gross grain ribbon and tie a knot on the bottom. Thread the ribbon through the hole and trim the ribbon ends after the know. Pull the loop of the ribbon through the center of your washi tapes and the are ready to hang! What I love most is how easy is it is to grab the Washi Tape Hanger and bring to a different room and it can hang from just about anything! How do you store and organize your washi tape? Share and leave a comment below! SAVE HOW TO MAKE AND EASY WASHI TAPE HANGER TO YOUR FAVORITE SEWING PINTEREST BOARD! How to Make Teacher Gifts: You are Mint to be my Teacher! Hi Katie,What a nifty idea!!Quick!! !Inexpensive and totally effective!! !Really nice!! !Something I can go and make straight away!! !Nice and Thank you!! !Have a fab week!! What a great idea and the perfect solution with what to do with all those roles of washi tape we all have laying around! Thanks for sharing 🙂 Stopping by from Crafty Confessions. What a great simple solution to the washi tape all over the place problem! I LOVE it! I am co-hosting a party with 3 other bloggers called The Project Stash and it is starting tonight at 8:00 pm EST. I’d love for you to stop by and link up your project! There is also a Shabby Apple Giveaway! Cool! If I had some washi tape I would make one of these! cute idea! this would be such a fun gift to give someone who loves crafting! Cute idea, I am just beginning my Washi addiction. This is a great idea. We came over from Weekend ReTweet party.